Welcome to the WBCSD’s Climate Smart Agriculture newsletter, our first for 2017. 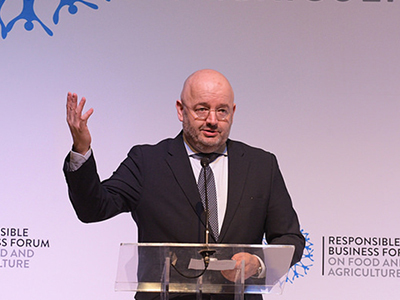 In this edition we are featuring some of the key developments and outcomes from our recent meetings at the Responsible Business Forum in Jakarta, where WBCSD President and CEO Peter Bakker outlined our agenda for food and agriculture, and the recent Bonn UNFCCC Technical Expert Meeting on land use and agriculture. If you, and/or your organization, are working on business solutions in agriculture then we would welcome your contribution in the many future meetings we have planned for 2017. 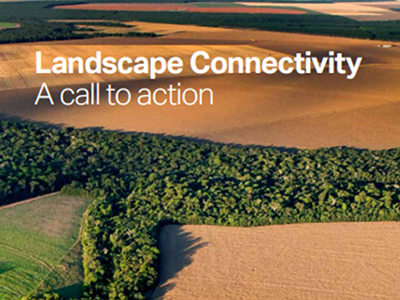 A key publication, Landscape Connectivity: a call to action was launched in Montreux at the end of March and has been well received in the agriculture and conservation community and in the media. We will be incorporating landscape connectivity recommendations in all of our CSA work. Anyone who has been working in the agriculture space for a while cannot be pleasantly amazed by the sudden attention agriculture and related issues have been receiving in major global meetings and in the media. The spotlight is now firmly upon our sector, and your contribution, through CSA business solutions and close collaboration with farmers and grazers, will be well received in the working groups and we invite you to share your solutions and stories in this forum. The 4th Responsible Business Forum on Food and Agriculture on 13-14 March, brought together over 550 delegates from all over the globe in Jakarta, Indonesia. Under WBCSD and Global Agribusiness Alliance sponsorship, the event was hosted and co-organized by our Global Network Partner, the Indonesia Business Council for Sustainable Development (IBCSD), Global Initiatives, KADIN and PISAgro. This multi-stakeholder forum provided the platform for influential decision-makers from the public and private sectors to find holistic solutions to the complex problems impacting agriculture in Asia, the region home to 85% of the world’s smallholder farmers. During the Forum, we interviewed some of the participants to launch a 6-part video series focusing on food-related issues. In this first video, we highlight the need for climate-smart agriculture (CSA) to feed the planet whilst efficiently preserving resources for the benefit of all, including the environment. Hear from Matthew Reddy, Director, Forest Solutions Group & Climate Smart Agriculture at WBCSD about the benefits of CSA. The WBCSD CSA group had a strong representation on 11 May at the UNFCCC Climate Change Conference in Bonn. Romano De Vivo, (Syngenta), Chris Brown, (Olam), Bernhard Stormyr, (Yara) and Matthew Reddy, (WBCSD) joined Gabor Figeczky of IFOAM Organics-International, Theo de Jager of the World Farmers Organization and Katia Simeonova (United Nations Climate Change Secretariat) for the Technical Expert Meeting (TEM) on mitigation, focused on attracting private sector investors and business solutions for ambitious GHG mitigation actions in land use. 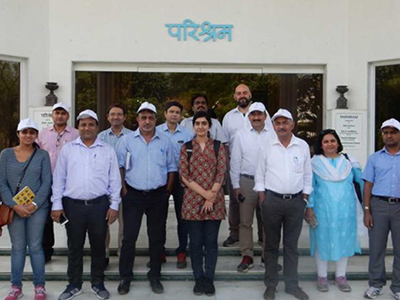 Jain Irrigation hosted a group of WBCSD member companies for a two-day visit of company’s facilities in Jalgaon, Maharashtra, one of India’s leading states in agricultural production. The visit brought together representatives from seven companies, part of the WBCSD Water-Smart Agriculture working group, to share innovation insights and discussions for collaborative opportunities between companies and farmers to address water scarcity in agriculture. 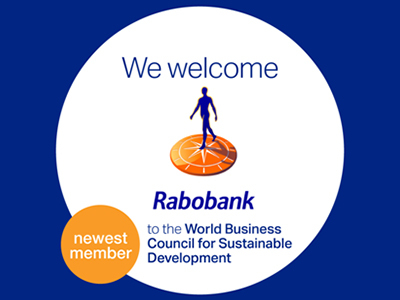 The WBCSD CSA working group warmly welcomes its newest member, Rabobank. As the finance sector will be key to the successful implementation of the Paris Agreement and our transition to a low carbon economy, Rabobank’s unique experience and leadership in agriculture will be a valuable boost to CSA’s finance work globally. Join the Rabobank team at the upcoming congress they are co-hosting with WWF around SDG 17 in Utrecht on 5 July. 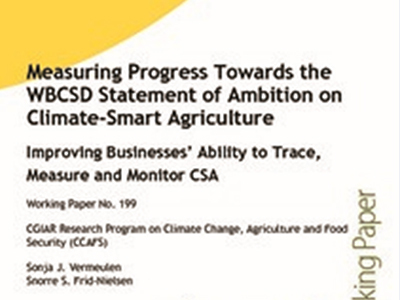 Based on work under WBCSD’s priority action area to improve businesses’ ability to trace, measure and monitor CSA, a new working paper provides a simple framework, sets of recommended indicators, and a stock-take of the current status of CSA progress under each of the pillars. 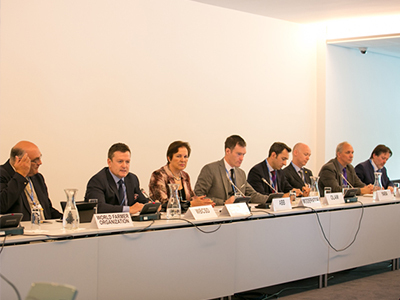 The purpose is to inform future monitoring and reporting on CSA among member companies, both individually and collectively, in support of the set of 2030 ambitions under the three pillars of climate smart agriculture (productivity, resilience and mitigation) that WBCSD announced at the Paris UNFCCC COP21 in 2015. Take a look at our recently released a call to action report on landscape connectivity, thank you for all of your insightful contributions during its development. The report raises awareness about landscape connectivity and the implementation of simple, workable solutions that promote enhanced connectivity Introducing landscape connectivity and its benefits, the report identifies policy gaps and outlines the roles that stakeholders can play in promoting and implementing supporting actions. Stay tuned - the report will be shortly available in several languages other than English. The Climate Smart Agriculture (CSA) program develops scalable low-carbon business solutions for food and agriculture, under the ambition of making 50% more food available by 2030 while producing 50% less GHG emissions. Led by the World Business Council for Sustainable Development (WBCSD), CSA is designed to achieve sustainable agricultural development for food, feed, fiber, fuel, and ecosystem services while addressing the risks and challenges presented by climate change. Borne out of the Low Carbon Technology Partnerships initiative (LCTPi), CSA is a value-chain project that includes all players across the agri-food value chain, with the aim of scaling up sustainable business solutions that can achieve the ambition and enhance the resilience of both landscapes and communities. Contact us at csa@wbcsd.org.